Olive, during her pre-CIA days. One recent grad was hard-working and popular, also a bit of a ham. Another was athletic and confident. The third was a dynamo, eager to take on new challenges. We’re speaking of Olive, Rico and Sunny High, Labrador pups who came to campus through Dickinson’s Dog House dog-training program. Like many fellow Dickinsonians, they’ve gone on to launch careers of distinction and service; one even works for the CIA. The Dog House is a student-run special-interest residence, founded in 2013 by Lauren Holtz ’15, Carley Zarzeka ’15 and Sam Silvershein ’14 to help prepare puppies with potential for lives as service dogs. The students live with the pups they socialize and train, and they work closely with staff at Susquehanna Service Dogs (SSD), one of only two organizations nationally that works with the CIA to train explosive-sniffing dogs. Each pup’s training lasts roughly a year and a half; SSD finds temporary homes for the canines during the summer and other long breaks. After graduation from Dog House, SSD determines what career would suit the dog best and then trains it for that role. Service dogs help disabled individuals perform specific day-to-day tasks. 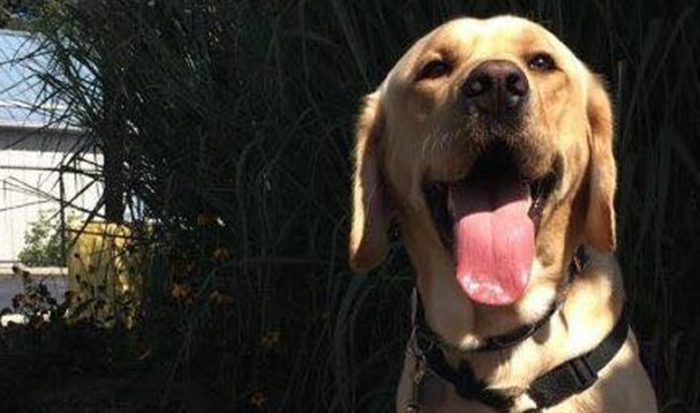 Police dogs, like the mascot McGruff, “take a bite out of crime.” Facility dogs serve inside a hospital, school or courthouse, and medical-response dogs respond to medical crises, laying down on a seizing person to prevent self-injury, for example, or pressing a button to call 911. Dogs who don’t make the cut become someone’s well-behaved pet. Olive, in her pre-CIA life. Three Dog House alumni have made it big so far. Rico is a local service-dog celebrity. Eager, easygoing and a fine physical specimen, he is so superbly suited to service-dog life that he works as an SSD demo dog and the first breeding dog for the American Breeding Cooperative. He’s sired several litters so far, passing exemplary genes on to a new generation. Dog House students occasionally see him at SSD events. Sunny High took the traditional route. Whip-smart and energetic, she sailed through the instruction. She now lives and works in the home of the human she serves. Olive was born in the Dog House. Described by students as “a workaholic” and attention-seeker, she performed well on all tests, but because of a harmless habit—above-average drooling when crated—she wasn’t an ideal service dog. CIA staff, however, loved what they saw in her and whisked her off to training camp in Virginia to see if she had the right stuff. Olive got the star treatment on her graduation day. During her 16-week CIA training, Olive learned to sniff on command and identify the scents of thousands of explosives—and roughly 20,000 mixtures of scents—presented to her in tin cans and metal tins. During the next round of training, she and her handler ran through obstacle courses in search of explosives scents inside cars, trucks, luggage and other objects. The exercises are rewarding—handlers are generous with treats, breaks and praise, and many dogs enjoy the challenge—but also far from easy; not every trainee makes the cut. So last November, four Dog House students were proud to attend Olive’s graduation ceremony at the CIA training headquarters, where they saw their former pupil demonstrate her skills and receive a doggie CIA badge. Students involved with the Dog House traveled to Virginia last November to see Olive graduate from CIA training. As an explosives detector, Olive helps her agent protect people, buildings and armed-forces bases, and her career may include overseas tours and on-call shifts with the U.S. Park Police, local police departments or the Drug Enforcement Association. She lives with her agent and agent’s family and works for her food by running obstacle courses that keep her skills sharp. Back at Dickinson, students keep abreast of Olive’s goings-on via her Facebook page. (“She’s thoroughly enjoying her new life as a working dog,” reports former Dog House President Margaret McGuirk ’18, an English major). They also continue to prep pups to serve the common good. Jackie and Chickadee are coming along nicely, as are the puppies whelped at the Dog House this fall.